President Trump paid tribute to Bush's "unwavering commitment to faith, family and country"
That's it for now - thanks for staying with us! The world has been paying tribute to the 41st US President George HW Bush, who died late on Friday aged 94. Details of his funeral are yet to be announced - you can get all the latest updates on this and other stories on the BBC News website. Former UK Prime Minister Tony Blair has described George HW Bush as "an extraordinary and exemplary public servant, a man dedicated to his country, the values it stands for at its best and to making the world better, more stable and more peaceful". "He was a great friend and ally to Britain, a supporter of the Transatlantic Alliance and a huge influence in the development of Europe after the fall of the Berlin Wall. "My deepest sympathies and condolences go to the Bush family at this time," Mr Blair said. French President Emmanuel Macron has paid tribute to George HW Bush, describing him as a "world leader, who strongly supported the alliance with Europe". Video caption: One of George HW Bush's most memorable lines helped him win the 1988 race for the White House. But it was also a promise that he would later break, costing him the presidency in 1992 - when he lost to Bill Clinton.One of George HW Bush's most memorable lines helped him win the 1988 race for the White House. But it was also a promise that he would later break, costing him the presidency in 1992 - when he lost to Bill Clinton. UK Prime Minister Theresa May has said George HW Bush's "ethos of public service was the guiding thread of his life and an example to us all". In a statement, she said: "It took him from service in World War II, to his stewardship of the CIA and his direction of the Gulf War as commander-in-chief. And in navigating a peaceful end to the Cold War he made the world a safer place for generations to come. "At each stage of his remarkable career, the president worked side by side with his friends, colleagues and counterparts in the United Kingdom. "Today Britain remembers a great statesman and a true friend of our country. We send our deepest condolences to the American people and to the family he leaves behind," Mrs May said. The New York Times newspaper looks at 13 items - including a basemen's glove and skull and bones - that influenced the 41st US president. Mr Updergrove also gave his explanation of why George HW Bush was voted out of office after his first term in 1992. He told the BBC: "Well it's not unlike what you saw with Winston Churchill. Winston Churchill was a great hero in the United Kingdom after seeing the World War II to its end, and yet he was voted out of office. "And something similar happened with George Herbert Walker Bush. "We had had at that point 12 years of Republican rule, two terms in office for Ronald Reagan, followed by a single term by George HW Bush. "And I think when George Bush was nearing the end of his term people widely believed that he was out of touch with the concerns of everyday Americans, as we started focusing less on events abroad and more on our domestic situations, our pocket book (wallet)," Mr Updegrove said. George HW Bush was in office during the final days of the Cold War when the USSR collapsed in 1991. Presidential historian Mark Updergrove has told the BBC how the former president used his diplomatic skills to help end the global stand-off in a peaceful way. "There's no question that George HW Bush made an immeasurable contribution in ensuring that the Cold War ended with a whimper and not a bang," Mr Updergrove said. "Again I think it was due to his great diplomatic skills, I think also his humility played a role there. "Bush made sure that he didn't crow about America's victory in the Cold War and beat his chest and what we call in America 'spike the football'. "He knew that if he did so it would compromise the leadership of (Soviet leader) Mikhail Gorbachev, and hardliners might rise up and jeopardise the collapse of the Soviet Union," the historian added. This is the gracious letter the losing Republican candidate left for Bill Clinton, when he entered the White House for the first time in January 1993. The letter says: "You will be our president when you read this note. Former US vice-president Al Gore says George HW Bush "served our nation with extraordinary integrity and grace". "I will remember him for his personal kindness and for his love of this country. "He earned bipartisan respect for speaking up and taking action for what he believed was right, even when doing so was unpopular." George Bush Snr's death underlines that while the Kennedys still remain the premier US political dynasty, the Bush family can also stake a claim to be up there on the top table. George H W Bush was not the first US president to have seen active service in wartime, but he was unique in having his exploits captured on film. Michael Johns, who was a speechwriter for George HW Bush, tells the BBC the former president was "a very personable and amicable man". "Had many great relationships that he has forged throughout a remarkable career, and I think most importantly - which obviously cannot be underestimated - is he had an extraordinary family". Mr Johns said he believed George HW Bush had "the longest standing marriage of any president in American history". George HW Bush and Barbara Bush were married for 73 years. She died in April. Former UK Prime Minister John Major has said he feels "privileged to have worked" with George HW Bush. In a statement, Mr Major added: "George HW Bush was above all else a family man and, for him, the American people were part of that family. "In public office he served as he lived, with compassion, courage, dignity and grace. "As president, he saw America's obligation to the world and honoured it - and he remained committed to public service until the day he died." Former US President Bill Clinton and former US Secretary of State Hillary Clinton have paid tribute to George HW Bush. In a statement, they said: "Few Americans have been - or will ever be - able to match President Bush’s record of service to the United States and the joy he took every day from it." Mr Clinton also tweeted, saying he was "grateful for every minute I spent" with George HW Bush. George Bush Senior's true test came in August 1990 when the US was caught off-guard by the Iraqi invasion of Kuwait. Bush moved quickly to build an international coalition to end Saddam Hussein's occupation and establish a US military toehold in Saudi Arabia, a valuable strategic dividend. 'Well, all right, George, but this is no time to go wobbly," said the Iron Lady in a middle-of-the-night phone call from Downing Street. The subsequent battle proved to be a triumph for American military expertise and a major boost for the nation's morale. 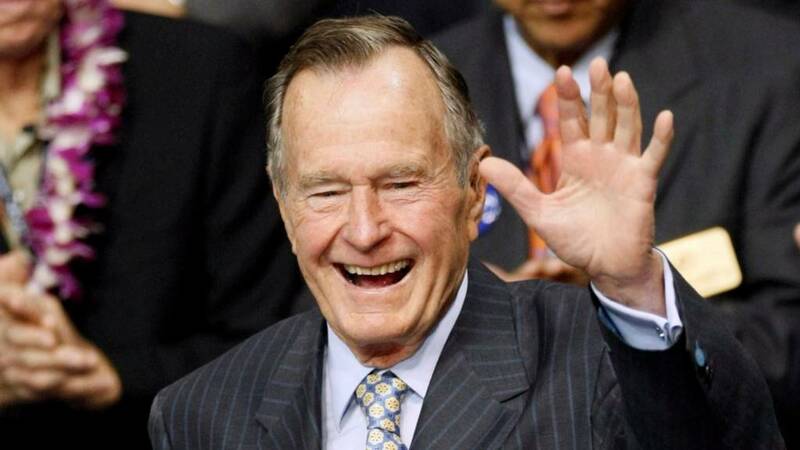 George Bush Senior died at 22:10 Central Standard Time on Friday (04:10 GMT Saturday), his longtime spokesman Jim McGrath said. Funeral arrangements are yet to be scheduled.